door, over tank,toilet, sink, laundry room etc. of Austenitic stainless steel.After polishing, the surface smooth and bright, lasting as new. Commonly used in food, chemicals, auto parts, medical materials and other fields. KOOLIFT has been a innovative leader in designing and manufacturing premium luxury bathroom hardware. Backed by our lifetime warranty, you can trust our products to always exceed your expectations and live up to their name. We have proudly stood by our true design and commitment to excellence. Luxury Black color adds great beauty for your bathroom decor, elegance looking for hanging your face towel beside your bathroom cabinet, and also look nice under your kitchen sink cabinet where keep your hand and dish towels. Long service life in humid environments. 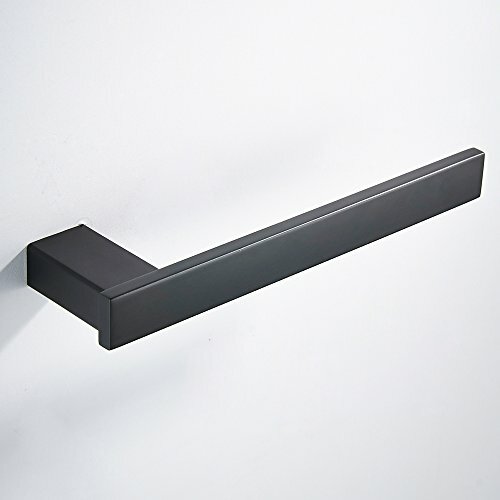 Thanks to heavy duty solid SUS 304stainless steel, great quality of black matte black surface, this Towel rack is durable and rustproof. One piece nature design, thicken bases are not loose, more durable. Simple line design is not easy to collect dust, easy to clean. This heavy duty towel ring, made of SUS 304 stainless steel construction that ensure great quality, low-lead environmentally material is more health, protect your family well. EASY INSTALLATION The transitional style bath hardware provides a tasteful upgrade with subtle modern elements. Comes with hardware included, super easy to install. If you have any questions about this product by KOOLIFT, contact us by completing and submitting the form below. If you are looking for a specif part number, please include it with your message.